This dairy packed recipe was created in partnership with the ADA Mideast. As always, all thoughts & opinions expressed below are 100% my own. I am finding it hard to believe that it is that time of the year again- back to school! Backpacks have been picked out & purchased. The school supply list has been checked off. And we are starting to ease back into that school year routine. Another way I am getting ready for the start of the school year is to start compiling a rotation of healthy breakfast recipes with staying power. The easiest way to do that? 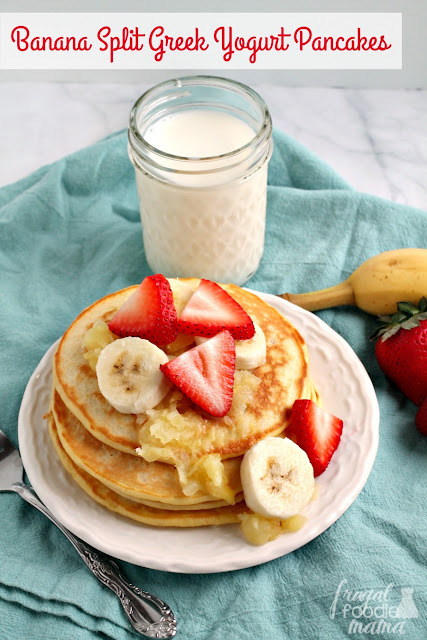 Making sure that each of these recipes are packed with protein powered dairy like these Banana Split Greek Yogurt Pancakes I am sharing with you all today. Not only are dairy foods a quick & budget friendly way to keep your kiddos fueled and ready to go throughout the day, but each serving also happens to contain 9 essential nutrients & 8 grams of high quality protein. Experts recommend that we get in at least 3 servings of low fat or fat-free dairy (think a glass of milk, a yogurt cup, a cheese stick, etc.) every day, but most of us need an extra serving each day to meet the daily nutritional recommendations. 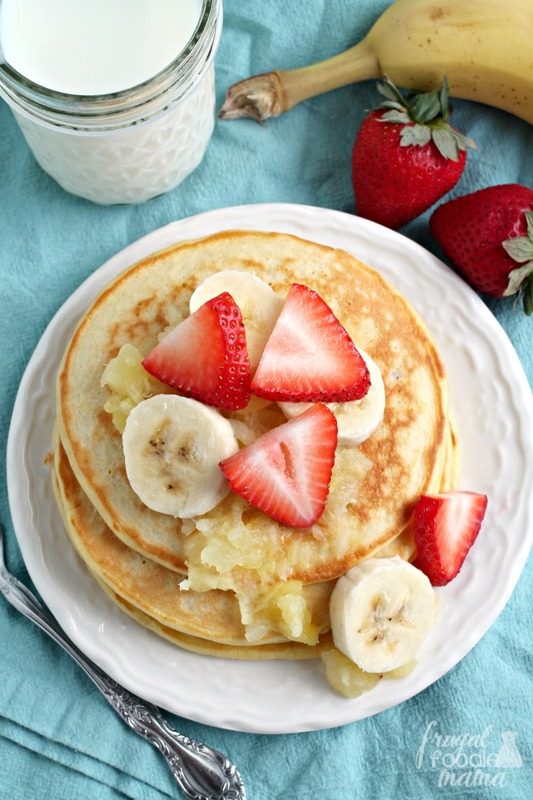 Lucky for us all, these tasty Banana Split Greek Yogurt Pancakes are chock full of low fat Greek yogurt & milk. They also happen to be 100% kid approved. 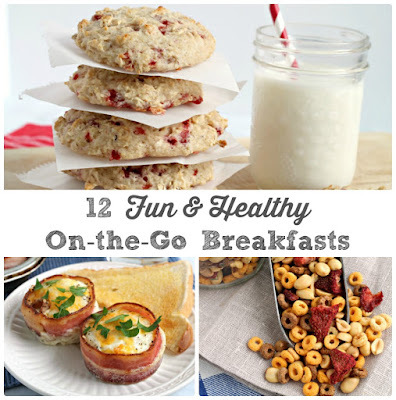 You can even freeze these & then quickly reheat them for an easy & filling breakfast on busy school mornings. In a medium mixing bowl, whisk together the eggs, Greek yogurt, milk, sugar, & vanilla extract. Add in the flour & baking powder, & then mix into the wet ingredients. 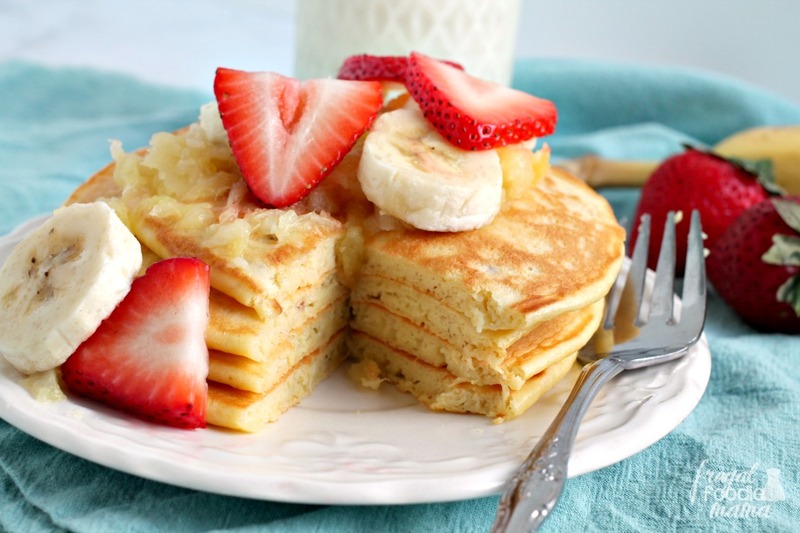 Stack 2-3 pancakes per serving. 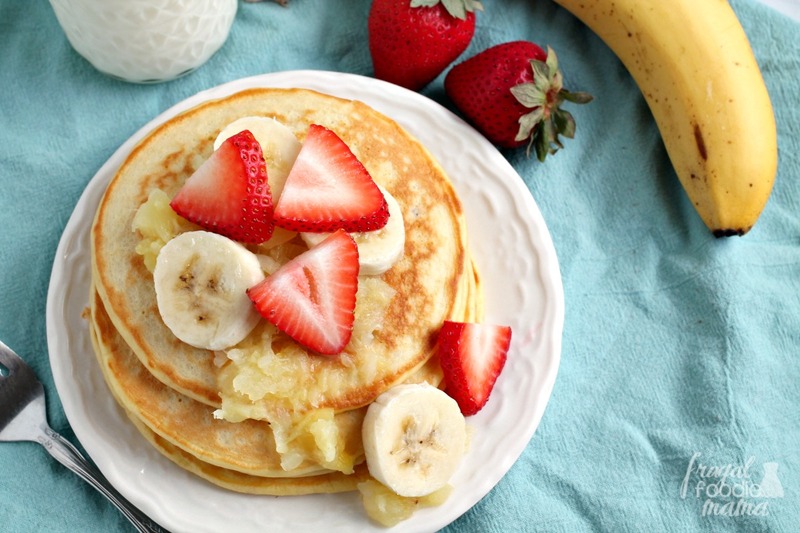 Top with about 2 tbsp of crushed pineapple & a few strawberry & banana slices. Serve immediately. Enjoy! I suggest making a double or even a triple batch of these if you plan on freezing some or all of them. Let the pancakes cool completely. 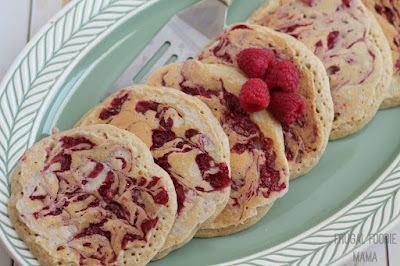 Arrange the pancakes into stacks of 2-3 placing a small piece of parchment paper between each pancake. Slip each pancake into a quart sized freezer bag. Stack the bags in the freezer. You can keep the pancakes in the freezer for up to one month. To reheat, simply remove from the freezer bag & stack the pancakes on a microwave safe plate removing the pieces of parchment paper between each pancake. Heat in the microwave on high for 30-45 seconds or until heated thoroughly. For more information on dairy nutrition, to find delicious new recipes, and to meet Ohio & West Virginia dairy farmers, visit Drink-Milk.com. And be sure to follow the American Dairy Association Mideast on Facebook, Twitter, Instagram and Pinterest! 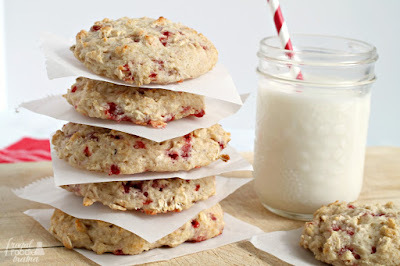 This recipe is also appearing on the Drink-Milk.com site.